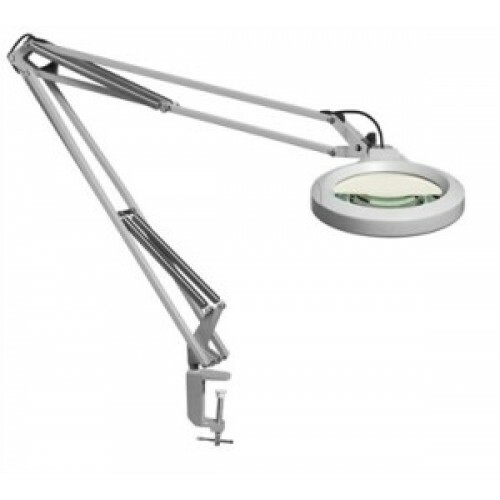 New Luxo LFM LED 3 Diopter (1.75X) Ring Magnifier, light gray, 45" arm, clamp-on base, 115 vac, 60 hz. LFM LED is Luxo's most cost-effective LED Magnifier. A die-cast aluminum housing and flexible, spring-balanced arm ensure the magnifier can be placed in any position. Supplied with a 3 Diopter (1.75X) 5" glass lens mounted within a circular ring of LEDs. This design allows for virtually shadow-free magnification. A cloth shade cover is provided to protect the lens from unwanted dust and debris. Light gray color. The LFM is equipped with 7 watts of dimmable LEDs which consume a total of 9.5 watts of energy. A 9/4 hour automatic shut-off functionality and step-dimming (0-50-100%) feature help to conserve energy.